Big Miracles come in small packages! I pulled into the parking lot at school today (Saturday April 26th) at 9:30 after swimming. The lot was full of cars and their were busy folks everywhere near the garden. 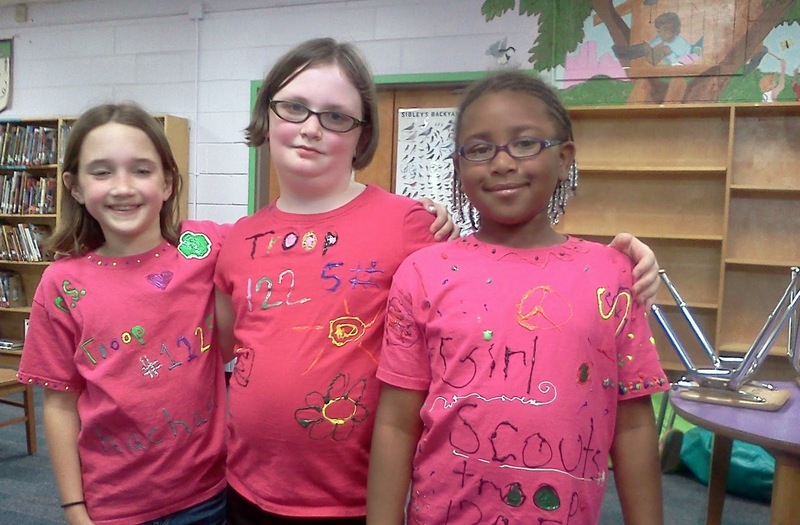 It was girl scout greenhouse build day! Dads had tools --- not just tools, but TOOLS. You know the kind that make a lot of noise. They were consulting plans retrieved over the Internet, and orchestrating it all was one of the most dedicated parents I have ever enjoyed working with, Kathy Ferguson. She has led our girl scout troop for several years and has overseen the year-long effort to collect the bottles and do the ground work required for such a large scale effort. The girls have been learning about the water cycle and conservation all year. They have also been learning about perseverance, dedication, postponing gratification, seeking funding, giving back to their community, and pride in accomplishment. Though I have only been a small part of this my heart swelled with pride as I watched the organized chaos in the garden while I shifted books with four other parent volunteers inside the library. They worked all morning and well into the afternoon. The girls saw their Dad's and Grand Dad's in a new light as they worked together, altering the plans when they weren't quite right, compensating for slight flaws in the frame, using their experience melded with the reality of the moment to change what they were doing together to get the greenhouse built. We hear educators talk about 21st century skills when in fact these were 1st century skills as well. If you do not have the ability to confront circumstances, assess what tools and materials you have at hand, and then work together to come up with a solution, it will not matter how capable you are on a computer, you will not succeed. But perhaps the best moment was when one of the girls confided to Kathy that she loved this day above others because she got to spend time with her Dad. 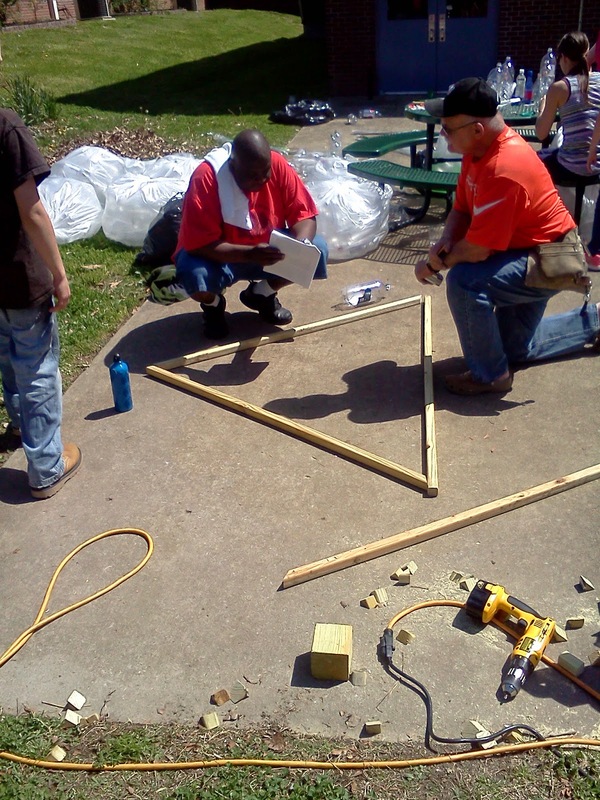 Thanks to every person and every scout for the Greenhouse that will make our school garden easier to experience and learn from since we will be able to start our gardens much earlier in the year! Hey you, STOP LITTERING! I never see you but the stuff you throw out is left for me to pick up! You drive off in you nice clean vehicle! What kind of person throws their trash out on the roadside? On my way into the Martin Professional Development Center yesterday I found a plastic bottle wedged into a plant, bits of trash scattered along the way, and the worst of all -- as I drove to Murfreesboro Rd (the main thoroughfare I drive to go anywhere from my housing development) I saw one McDonald's bag, and 4 plastic water bottles. Unfortunately I couldn't stop to pick each one up because of traffic. I can only hope that a jogger or community worker picked them up. 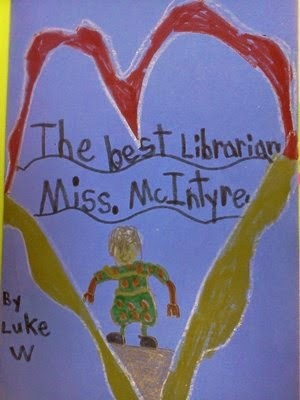 When I returned to school after the all day meeting, one of the little girls, a first grader, rushed up to me. "I asked my Mom to recycle a bottle this weekend. and you know what she said?" "No," I replied, expecting the Mom to commend her daughter for her desire to keep the earth clean. "She said we don't recycle." "You did the right thing, I said, maybe I could talk with your Mom." I'll let you know how that goes. 1st grade architectural drawing of the perfect clubhouse! A wonderful week of sustainability. Ms. Burgett's were the 1st of five classes exploring energy conservation. 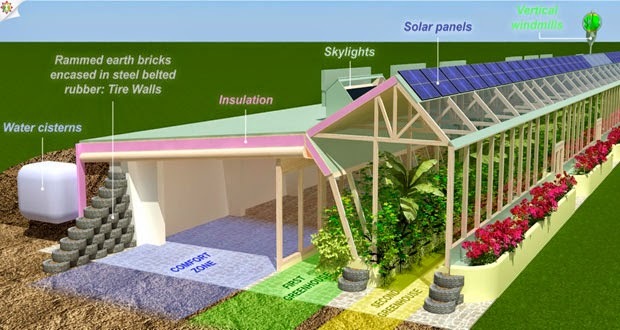 Since buildings are the major source of global demand for energy and materials that produce by-product greenhouse gases building green is an important concept that must be understood if we are to ameliorate rising carbon levels in the atmosphere. The students used their developing presentation skills to show off their architectural drawings of the perfect energy-efficient (see checklist in the picture) clubhouse. They have been thinking seriously about using energy and the impact it has on the environment. They have conscientiously been picking up trash, recycling not only to keep waste materials out of the environment, but also because using raw materials to make new things uses so much more energy. Even though the mathematics of percents are not 1st grade concepts they can understand that recycling aluminum saves 95% of the energy that making a can from scratch requires. Next week they will meet a real architect who works to design and build Leed certified buildings. I took the student's drawings and the book they read to him yesterday so that he would know what they have been thinking. Cory Dugan works for TLC Engineering, a firm that designs buildings for corporate and governmental organizations that meet LEED standards. They also adopted the Architecture 2030 challenge which intends to create carbon neutral buildings by 2030. As I write I am looking out at the framework for the Girl Scount Greenhouse going up. We will have the greenhouse set up next weekend! Cheers to sustainability! The kids were fascinated to see people building earthships. These buildings are completely self-contained. They take no water, electricity or gas from the grid, and they produce no waste. I was equally stunned by the use of so many materials that we regularly discard to make lovely homes that are totally carbon neutral and healthy! As I think about the impact we have in schools I think that this quote by Neil Gaiman says it best. “Stories you read when you're the right age never quite leave you. You may forget who wrote them or what the story was called. Sometimes you'll forget precisely what happened, but if a story touches you it will stay with you, haunting the places in your mind that you rarely ever visit.” M is for Magic I would just change one thing about Neil's quote. It isn't only the stories we read or hear that never quite leave us---it is the story we see being lived in those around us that awakens us to our own potential! April 13 - Blooms and Green deeds. psychologists developed a way to categorize levels of intellectual behavior. 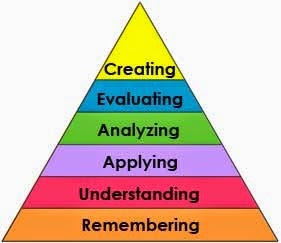 Today educators are expected to find ways to pull kids through the stages and get them to the point where they are at the pyramid's peak. The graphic at the top is the result of work by a new group (1990s) of cognitive psychologists, lead by Lorin Anderson (a former student of Bloom). The updated taxonomy reflects relevance to 21st century work. The graphic on the right shows the original Taxonomy. 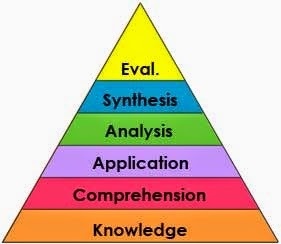 Note the change from nouns to verbs associated with each level. Everything now is about doing! We move faster we do MORE. Kindergartners are forced to master work that was formerly 1st grade work. There is no time to allow students to develop at their pace, even though that is what is touted in differentiated instruction and in the "new" old Dewey models which give students choice and voice (note the alliteration). Yes they have choice and voice --- but be sure to keep up! I always used the taxonomy and think it is very helpful in REFLECTING on my own thought processes and the processes of my students. So what has changed? We are being PROPELLED toward a future in education which is being driven by technology. In some ways this is good and in some ways I am ready to say, WAIT just a minute. We need to think and to reflect about what we want the future to look like. SHOULD everything be about GDP growth and employees being "ready" to plug into an employers needs? Maybe. Maybe that is not what we should be about in education. There is a growing movement toward a different measure of success. The Happy Planet Index focuses on a broader measure. Is the future that technology is driving us toward one of sustainability? Check out the Index and give it some thought. In an article in the New York Times about raising a moral child a study in 50 countries found that what was valued most was not achievement but caring. Would I rather live in a world where people care about their neighbors and the world or one in which corporations happily tell us what we want and convince us that we need to purchase it. Technology is neutral. It has no concern for humanity or this beautiful blue ball we live on. It s a tool. WE choose how to use it and my question for today is WHAT are we choosing by not being educated and aware? What are we choosing when we allow ourselves to be manipulated by a media which is bought and paid for by vested interests? One of the pieces we've used with the 1st graders this week as we talk about recycling is video footage of the great Pacific garbage patch. 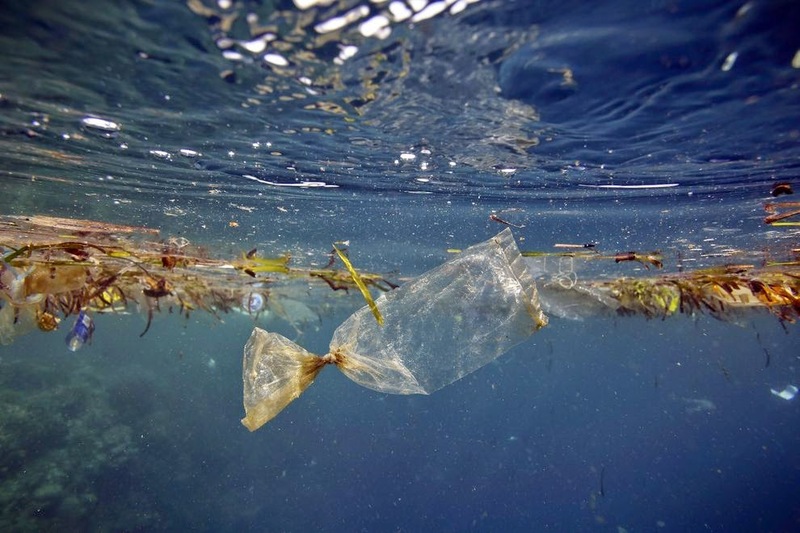 Once the kids see the garbage, twice the size of Texas, swirling and realize where their plastic can end up there is a sense of commitment to keeping plastic out of the environment. One of the students shouted out, "Texas is the second biggest state in the U.S." 1st graders have a great capacity to remember data so now is definitely the time to form good habits. They are especially moved by the photo of a bird which has died from ingesting too much of the plastic. A bright red lighter is clearly one of the items he consumed. Following the presentation we talk about the ways we can help. The obvious responses included personal responsibility, and maybe writing letters to try to keep companies from using so much plastic, but the most important role that these little citizens can have is in helping educate themselves and others. These are definitely common core higher level thinking skills! I always share my personal Green Deeds for the Day and ask them what they have done. 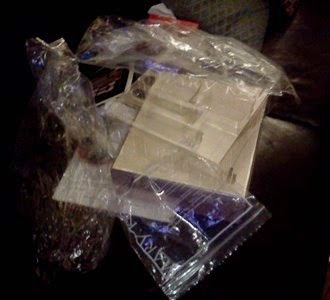 I acknowledged that I wrote a letter to Mary Kay about over-packaging in my order. As is often the case, the children helped me realize that since the beginning of this project WE have been engaged in educating, each others. When I went to purchase plants and seeds at my favorite garden center for our school garden I shared that my sense of weeds had changed and that I now viewed them with a respect due plants that were indigenous and important parts of the ecosystem. Then we talked about why I wanted to plant cabbage. 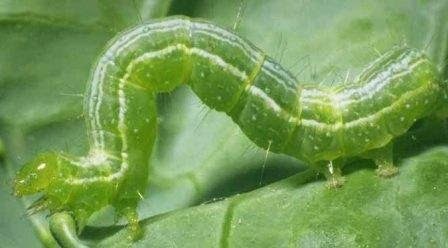 When I explained that I wanted the kids to see the life cycle of the cabbage moth, she was appalled. "I spray for those," she said. This gave an opening to discuss the value of insects and natural balance and not using pesticides or herbicide to control them! While I don't think I won a convert, she was thoughtful, "Well, you've certainly given me something to think about" she said. This is all a teacher can hope for. To give someone food for thought. We are working on recycling this week with my first grade friends. Today was a good day for problem solving. I brought in my Mary Kay order that arrived yesterday. It was beautifully presented, but sat nestled in formed plastic in a beautiful box surrounded by a plastic sack along with two other plastic sacks containing little rewards for my purchase. These plastic bags were packed in Styrofoam in another exterior box. At first the kids were not sure about what was wrong. Then we watched a very informative video about plastic in the oceans. I did not tell them why I was upset, but after seeing the impact of plastic in the ocean they could figure out why I was distressed by my order. When they got it...they really got it. "How can I do something about this?" After several suggestions one of the students settled on talking to the person who owns the company. We also talked about how people need to learn about these things and how we can all be teachers to help others learn what we know. Then we talked about how our community needs to have plastic recycle containers next to the trash cans, so that when we pick up plastic waste that is thrown on the ground we can put it in the right place. Some of us are going to write our Mayor. I especially liked what one of the children said about a person who picked up and disposed of trash, helped others learn about recycling or wrote letters to people. Without any prompting, the student said, "He is a good citizen." Today there were 21 good citizens thinking of ways to help the earth in the library! 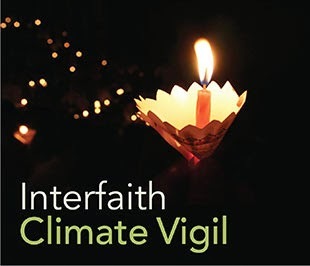 Possible Green Deed for Saturday, April 12th @7:00 p.m.
• offering opportunities for further engagement and advocacy. One surprising thing about encouraging my kids to be more aware of the environment and see possible green deeds is that I have done this as well. This past weekend I took my glass to recycle it at the collection point near my home. I was not alone. Lots of folks were there to recycle. Here is our jumping off point for learning about recycling! -- Take the challenge track trash in your environment for a week and document it with your cell phone. You'll be surprised as was ! But the saddest thing I saw was what was in and around the big containers. 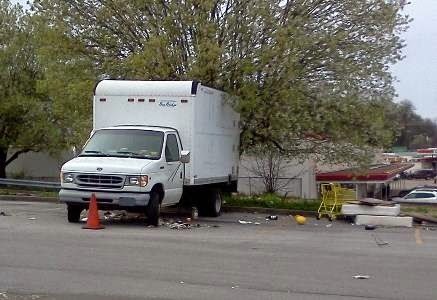 Adjacent to the collection site was a truck surrounded by trash, even mattresses. Why would someone park there and try to do a PigPen recreation? 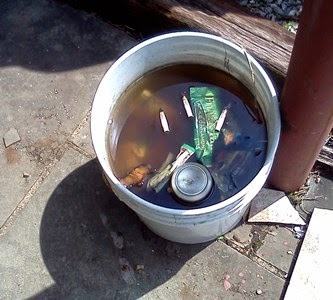 It had rained the night before and I found trash floating in containers making it even more unappealing to do a green deed and pick up the trash floating there.I walked away. Everywhere I turned there was a green deed waiting to be done. 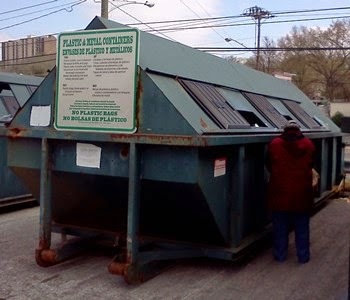 The people at the collection center told me that they were recycling because they cared about the world, and they were distressed by the obvious flagrant violation of good citizenship we saw all around us. This week students are working on recycling as a way of saving energy. Our students will learn that recycling aluminum save 95% of the energy of mining and making a can from new aluminum. I'm interrupting the flow of Green Deeds with this post on evaluation. Teachers are constantly being evaluated. The most recent was one in which students filled out evaluations on their teachers (don't even get me started on what I think of asking kindergartners whether they like being at school or not). We all do best when we believe we are held in high regard by our superiors and colleagues. Even when we are not doing great the belief that others hold us in high esteem propels us toward what John Wesley would have called "perfection." When I arrived at school on Friday morning, later than usual because of a tornado warning, I was surprised. 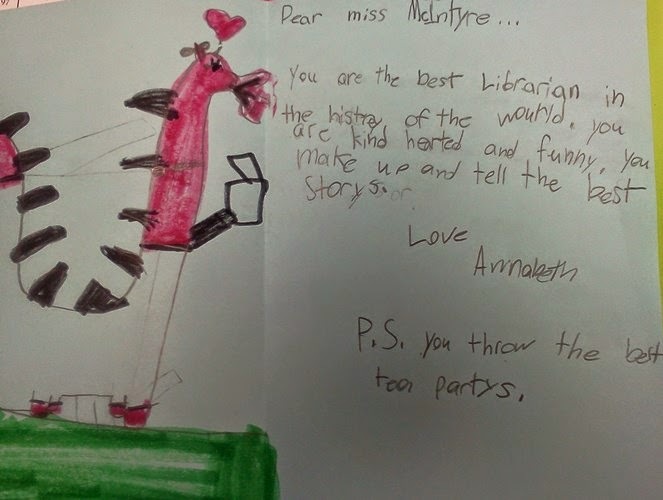 I pay no attention to things like School Librarian's Day and while April is National Library Month, I usually am too busy with teaching projects to do much in the way of honoring libraries. I was unaware that Friday April 4th was School Librarian's Day -- until I walked into the library where I found a delicious continental breakfast waiting. Then I was flashmobbed by Ms. Foster's 2nd grade singers, and then deluged all day by cards and letters to tell me that what I do matters. It was impossible to focus on work with so much joyful chaos around me. My school is filled with outstanding teachers who love and care about their students, who lose sleep over them, who come in on weekends and stay late at night only to hear that they are failures --that our schools are failing. I'd like to deliver a message to education commissioner Huffman and Governor Haslam. Perhaps the measures that evaluate student and teacher performance are hopelessly flawed. I am not convinced that we understand what we want to evaluate. Maybe there needs to be a question on the evaluation form for children, "My teacher throws the best tea parties" with radio buttons for yes, no and maybe! Paige stood in front of the circulation desk as kids checked out their books at the end of he day. I looked up, "What cha need, kiddo"
"I want to wait 'til they are gone she whispered secretly." Green Deeds are growing. Pun intended. It is delightful to watch the students think of ways to respond to the challenge to behave responsibly toward the environment. 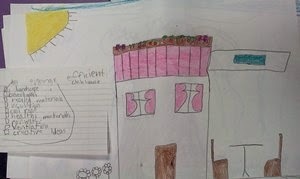 Each day students remind me just how creative they are with a new green deed I had not thought of. Today on WMES morning news the 4th grade news team took on the cute little light-up Puffer Chick for spring. This is one of those toys kids love for a few seconds before abandoning it for the next cute thing. 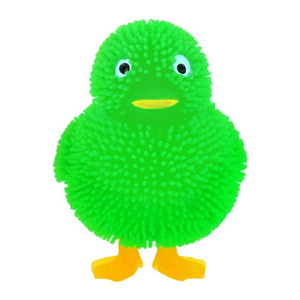 It is squishy and stretchy and when you squeeze it it lights up with flashing pastel lights. Cute as it can be this is a truly fun and cheap toy. What could be wrong about that? The team discussed the ramification of the battery inside the chick and its potential destination in a landfill. Then of course there is the issue of plastic abandoned in a landfill and where it can ultimately end up. Paige proposed that her 4th grade class help solve the problem of batteries in landfills They did some research learning that there are places to recycle most batteries. Batteries Plus and Radio Shack both have programs to keep batteries out of landfills. So on tomorrows news Paige will announce that students may bring old dead batteries to the library for recycling. They have designed a fanciful shoebox to collect them and will take them to the center themselves. I adore the fact that kids are coming up with things to do on their own! This is turning out to be as instructive for me as it is for the children. I began the day by checking on the Bluebird box near the music portable. A sparrow had co-opted the box ( My bluebird expert friend, Sam Jones told me to remove the nest, clean the box, and cover it with plastic to make it temporarily inaccessible). As I walked back I picked up a piece of plastic which had been shredded by the lawn mower, two magazines, a pen, and several other items. Was I just unaware before? Did I really not see trash that was right there? Maybe I just saw what I expect and now that I am actually looking I am seeing trash in the environment. As I traveled the road to work I noted that the further I moved toward Westmeade the less trash I saw. 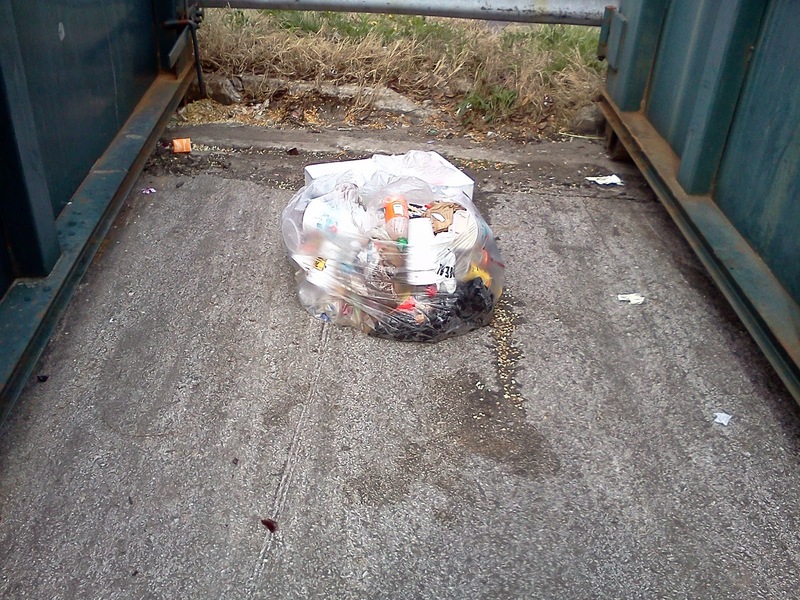 The observation made me wonder why the areas around Antioch have a greater density of waste than those in Belle Meade. Later that day first graders came to explore energy and conserving it. They went on an energy scavenger hunt and found 25 different things that used energy in the library. It was great fun! 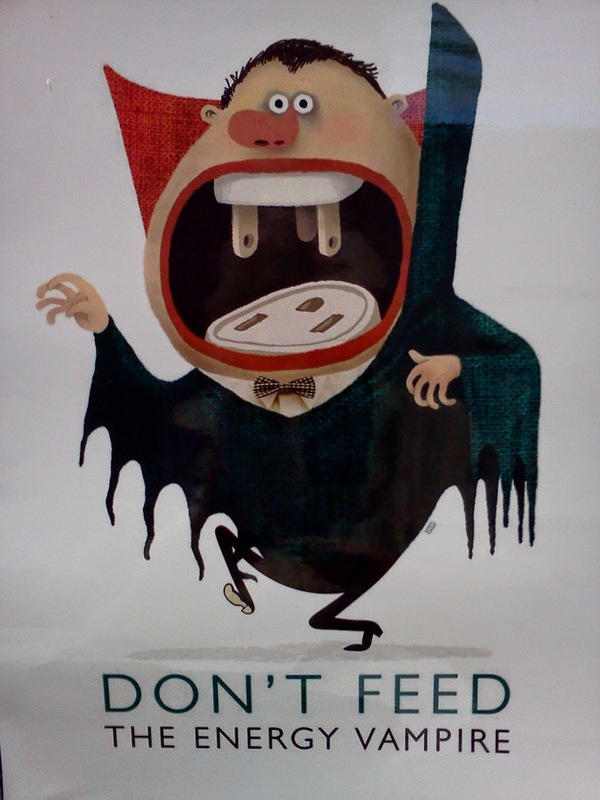 The challenge for them over the next few weeks is to think about caring for our earth by finding ways not to feed the energy vampires. They will be thinking about energy as it relates to recycling and building for conservation. Last summer I met Helen Hall, whose sister lives here in Nashville. Helen had written a set of books for primary students about energy consumption. I purchased a set so that the children could read the works chorally and we have been planning this unit for some time as a combination of science and social science culminating in service education. It will be interesting to see the many ways the students find to conserve and recycle. My green deed for today unfolded naturally but unexpectedly as Kindergarten arrived for their weekly visit. 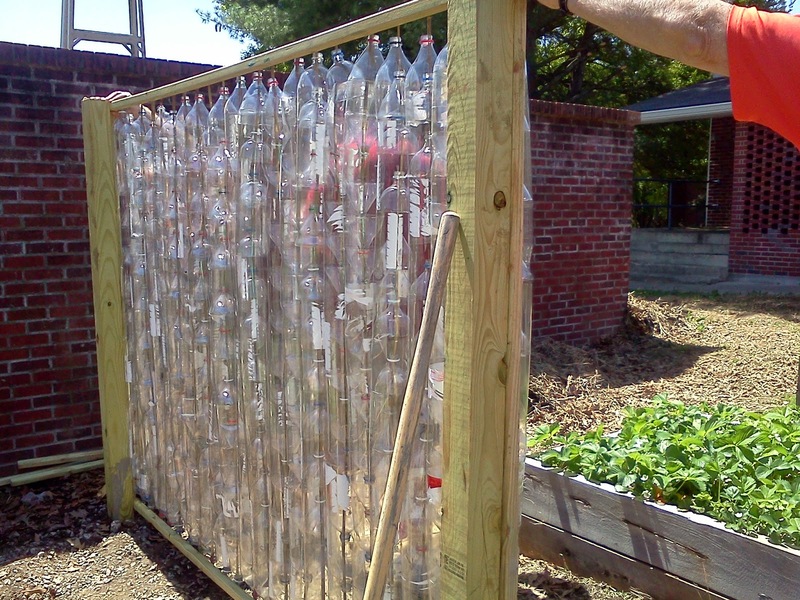 I offered the Green Deed Challenge, and they were excited about winning prizes for doing good. Once they heard what a green deed was they were curious and interested. 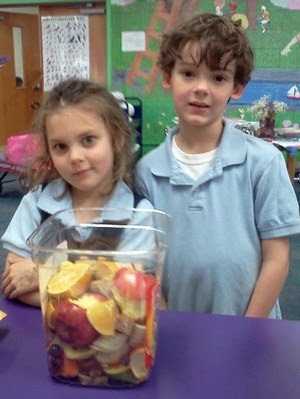 My compost from home sat on my desk in a clear plastic container --- They wanted to know, "What is that?" We talked about what was in the jar. They had fun guessing. They were getting excited and started sharing instead of questioning. It is always difficult to get Kindergarten to understand the difference between a question and a good story. Like good raconteurs they want to share something from their experience. Getting to questions requires a discussion of what a question is. We go through the Who, What When, Where, Why and How before we settled back into take questioning. "Why do we need to recycle?" A good direct question deserves a simple strait-forward answer. We need to take care of the earth if she is going to tae care of us. Suddenly there was a remarkable response. One of them said, "could we save our left overs from lunch for the compost?" I had not thought of that, but it was a great idea so we talked about what we could put into the compost. I gave them one of the big plastic containers that I had from candy from an AR party and they proudly returned it to me for the compost! Their first green act the collection of the waste from lunch for our compost bin, but what was even more amazing were the questions and thinking they exhibited. My second Green act was to pick up the coffee grounds at Starbucks for our compost! Today was a twofer!